Please take time to read through the information on this page. 1 & 2. External Doors. Install British Standard locks on all external doors, including internal door to the garage. 3. Patio/FrenchDoors. Install Patio Door Locks/Bolts. 4. Gates & Shed. Install Padlocks and Padlock Accessories Pack or Rim Locks to Shed. 5. Windows. Install window locks for the correct window. 6. Garage. Install securely locking door with option to padlock inside. By applying the above security measures you have provided the most minimum lock security that you can to your property/premises. Most insurance companies will require that you have the above including the British Standard locks on all external doors. 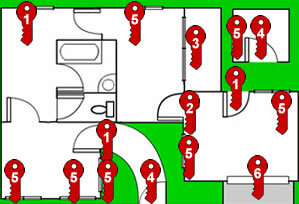 At present BS3621 2004 (Thief Resistant Lock Assemblies  Key Egress) are the standard required. The thief is on the lookout for an empty house - it need only be empty for a short amount of time perhaps while you are out shopping or visiting a neighbour. You might even be just out in the garden. He is looking for quick and easy ways in and easy ways out again. Now consider your own home. If you locked yourself out could you get back in again easily? Do you know of a window that has a loose catch that can be knocked open from the outside? Or a door that has a weak lock and opens under shoulder pressure? Or where there are some ladders you can use to reach an open upstairs window? If you can get back into your own house without keys, so can a burglar and he wont mind if he does some damage in the process. Approximately 60% of burglars break in from the back of a property where they are less conspicuous and can therefore work at ease. Many burglaries also occur in the day when noises such as breaking glass attract less attention than at night time. Home security is all about making life as difficult and risky as possible for the potential burglar. Your house needs to appear as unattractive as possible to him. He must be made to believe that there might just be someone at home. He needs to be made aware that you, the homeowner, have taken steps to make life difficult for him. He needs to be made to feel so unsure that he will go elsewhere. It is not difficult or expensive to achieve this. That the back of your house is more at risk than the front. Anything which delays him will deter him and the best deterrents are quality locks fitted to all the vulnerable entry and access points. Door and window locks will deter many casual thieves who are looking for a quick and profitable opportunity. 1. Ensure any work carried out is guaranteed. We guarantee all our work against faulty materials and craftsmanship for a full twelve months. 2. Ensure the Locksmith you choose is fully insured. We are fully insured so you can rest assured when dealing with us that everything we do is covered. 3. A mortice locked door will ensure that, even if a burglar has managed to enter your house through a window, he wont be able to carry his plunder out through the door. 4. 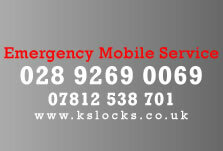 Many insurance companies will specify a BS3621 five-lever mortice lock must be fitted as a condition of home insurance. 5. Look out for the British Standard kitemark  the sign that assures the lock will withstand drilling, picking, cutting and forcing. 6. 'Choose a higher lever'. As levers facilitate the locking action, the more there are, the harder it will be for the lock to be forced. In most homes, mortice locks have between two and five levers. 7. Make a habit of always looking through your door viewer before opening the door. 8. Check the viewing angles available on door viewers before buying. The greater the viewing angle, the easier it is to see callers  wherever they are standing. 9. It's a good idea to ensure your night latch has a deadlocking facility. Adding extra security, giving the key an extra turn will deadlock the night latch so it can only be opened with a key from the outside but not from the inside  foiling the thief who has smashed door glass to reach in. 10. Use night latches as an additional rather than sole means of security. As it is screwed to the door, it may still be possible for burglars to kick the door in or trip the lock tongue with a thin piece of plastic. 11. Be especially vigilant if your garage has a connecting door to the house. Once a thief is in your garage he can break-in to the house un-seen. 12. It's probably worth making sure your household insurance policy covers theft from your shed and garage. 13. Always remember to remove the key from your patio door lock when you are not using the door or go out. Hide all keys in a safe place.